To JOIN IN ‘THE SAINTS’ public sing-along and celebrate the 50th anniversary of a great event! TELL YOUR FRIENDS, USE SOCIAL MEDIA, CROWD SOURCE…. 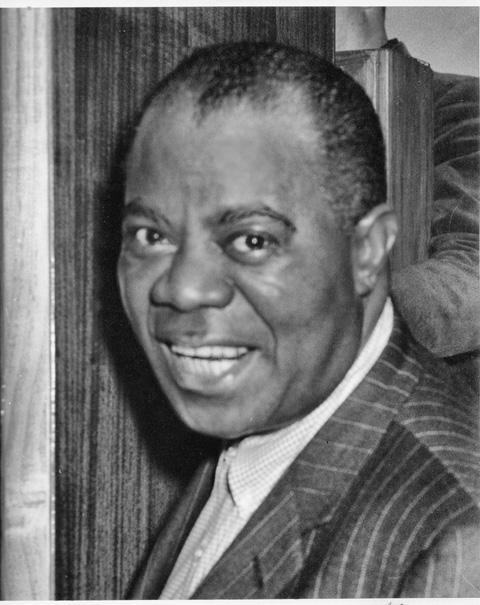 Louis ‘Satchmo’ Armstrong will have the Saints marching again in Hamilton (New Zealand) on Wednesday 20 March – celebrating a half century since his sell-out concerts in the city’s Founders Theatre in 1963. Back then, the ‘jazz king’ concluded his performances with his signal New Orleans number in what was then the brand new Town Hall. The 50th anniversary event line-up will have Hamilton Jazz Society band Art Gecko playing Armstrong’s favourites, and include ‘When The Saints Go Marching In’ with an audience sing-along. And share your memories with us…. Bill’s sister was there in 1963, and Isy K was there too. City councillor Martin Gallagher recalls his parents excitement at going to the concert. A plaque commemorating the Louis Armstrong shows will be installed in ‘The Founders’ beneath the bronze piece recording the theatre’s debt-free opening by Mayor Dr Denis Rogers in 1963. The 2013 plaque features veteran photographer Bill Lindberg’s shot of ‘Satchmo’ chatting to fans thronged outside. The theatre balcony was buried a decade ago within the theatre’s entrance redevelopment.